It has probably become a cliché to say that Dominica can learn many lessons from the numerous storms that has devastated the island over the past three decades. Nevertheless, as we have said in earlier editorials, Dominicans continue to display an unhealthy level of complacency catastrophe after catastrophe, from Hurricane David to Tropical Storm Erika. Now that Erika has crippled Dominica's infrastructure in August 2015 we are repeating ourselves- we care so little, we take things for granted, we like it so. As we will show in a series of articles in this issue of the Sun and the next, researched and written by veteran journalist Gwen Evelyn, much has been done since Erika struck one year ago but there is so much more to do. We offered the same advice after Hurricane David devastated Dominica 37 years ago. But Erika was not even a hurricane and yet it caused more than $1 billion in damage to the country's infrastructure including Douglas-Charles, Dominica's main airport. The country's struggling economy has been crippled for many years to come. Ironically, Dominicans will observe the anniversary of the passage of Hurricane David two days after Erika's. Although it can be said that the physical and psychological scares of Hurricane David have somewhat healed, we believe that Dominica has not effectively learnt the lessons that it should from the ordeal. Following Erika there can be no doubt that the island is still as vulnerable as it was on 29 August 1979. And our expert will tell us so in an article on page seven of this issue of the SUN. On that day, one year after the island attained political independence from Britain, David, a Category Five hurricane packing winds of 150 miles per hour and carrying millions of gallons of rain slammed into the island. David striped trees from mountains and smashed homes to smithereens. After pounding Dominica for more than six hours, 56 people were dead, more than 180 injured and 75 percent of the population were homeless. For many months after the hurricane, hundreds lived in tents or lodged with more fortunate friends. Most significantly, Dominica's economy was virtually swept away by the winds of David. 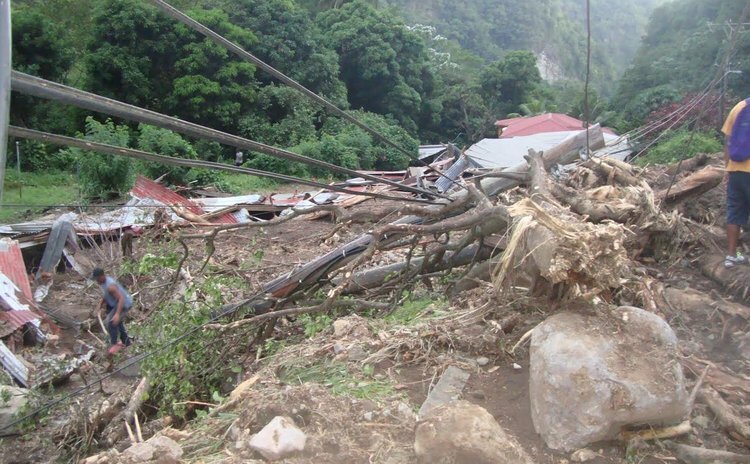 Roads and bridges were destroyed and on Dominica's farms, almost every banana plant was broken and coconuts and other fruits littered the ground. Thankfully, many countries came to the aid of our distressed country. After two months, the Interim Government of Oliver Seraphine announced that it had received pledges of US$37 million mainly from the United States, Britain, Canada and Caribbean countries. Apart from the physical damage, one of the more lasting impacts of Hurricane David was the massive exodus, in the wake of the storm, of the country's human recourses especially young, educated and trained members of the work force. That impact is still being felt 36 years later. The point we need to stress here is that given the severe pain that David caused and the generally high cost of natural disasters, one would expect government and the population generally to plan more adequately because we do not exaggerate when we say that the threat of being devastated by another major hurricane or Erika-type storm is as real as Dominica's green mountains. Long before Erika struck, architect Severin McKenzie told us that he believed that Dominica needed to go beyond the "antiquated approach of having people in disaster relief committees as opposed to preventing disasters from happening." Severin added: "If you know your house is not strong enough, before a hurricane you can strengthen it. So be proactive and retrofit your house. We are not moving in this direction at all." In other words we are not taking measures to reduce the cost of disasters. The experts like McKenzie have painted a picture of a country whose defining principles are yet undefined, a country which is a walking and stunning refutation of the old scout motto of being prepared. "We still see quite a number of waterways blocked. We haven't seen any evidence of a concerted effort to clear the drains, for example," McKenzie said. "We know that some of the damage to our roads is because of blocked drains." The experts contend, and we concur, that not enough attention is placed on risk reduction and that has to be high on the national agenda. Based on discussions with persons who are familiar with the state of Dominica's preparedness we conclude that though Dominicans are definitely more aware of the occurrence and consequences of hurricanes and tropical storms due to the mass media and the Internet but the country is as underprepared for a major disaster as it was in 1979 or in 2015.